24/4/08 — Acquisition — Lausanne, Musée Cantonal des Beaux-Arts — The Swiss museum purchased a painting by Camille Corot representing Ouchy near Lausanne (ill.)  for 140,000 € (without charges) on 28 March at the Hôtel Drouot at the auction of Maître Lucien Solanet’s collection. The work is listed in the catalogue raisonné, a first for the artist, by Robaut and was published recently in Corot à Mantes . It had been offered by the painter around 1840 to Madame Osmond and had remained among her heirs until its sale in 1982 when it had been acquired by the French auctioneer. 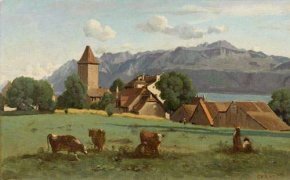 Its mate, a View of Lausanne, is today held in a private Swiss collection. Both canvases were probably painted in about 1842 during one of Corot’s stays in Switzerland (his mother’s family was originally from there), on the shores of Lake Geneva, glimpsed at the right behind the roofs of the village. The name of the purchaser was revealed by the Gazette de l’Hôtel Drouot of 4/4/08. Rodolphe Walter, Corot à Mantes, n.s., 1997, n° XIX in the catalogue, p. 185-186.